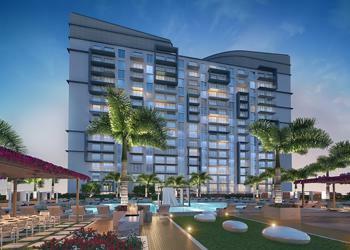 5350 Park is the newest condo coming to Downtown Doral. 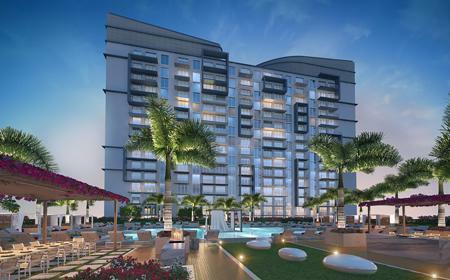 A 120-acre community in the heart of the vibrant city of Doral. The project will join 5252 Paseo and 5300 Paseo as the city’s most sought-after luxury condos. 5350 Park will offer 238 residences and resort-style living with incredible amenities such as sauna, designer lobby by GioCasa, electric car charging stations, and much more. The developer, Codina Partners, has over 30 years of experience with a proven record of success. This guarantees Downtown Doral as a safe investment, whether you are looking for a primary residence, vacation home, or investment property. 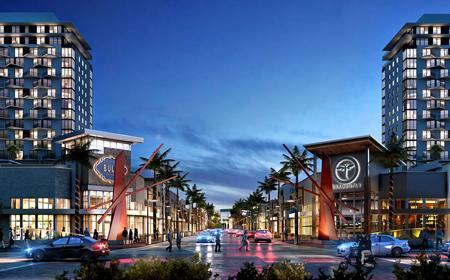 5350 Park is located in the sought-after 120-acre urban village of Downtown Doral, here residents will be a short walk from dozens of shops, cafes, and restaurants along Main Street, as well as a charter elementary school, Publix supermarket, and a three-acre park. Dolphin Mall and IKEA are just a short drive away. Doral is just north of the Miami International Airport (8 miles away). In minutes you could be in Coral Gables, Miami Beach, or Brickell. Living in Doral means having easy access to major highways (Palmetto, Florida Turnpike, Dolphin Expressway) that will take you anywhere you wish to be in Miami. Very rarely is the perfect escape right outside your door. Just a few steps from this unique residential tower a 3-acre park invites you to reconnect with nature as well as your creative side. Expand your senses on lush grass and under the soaring monumental sculpture created by world renowned artist Michele Oka Doner. From the lobby to your living space, 5350 Park has been thoughtfully planned. Acclaimed designer Giorgio Ferrara has created a lobby that gracefully brings the outdoors into your home by using a color palette inspired by nature. Masterfully crafted to expand your possibilities, at 5350 Park you can expand your living space with the option to purchase an adjacent studio to your residence, complete with a private bath, kitchen and separate entry. Now you can breathe easy with the ideal solution for guests, a growing family or a personal office. 5350 Park has studios, 1, 2, and 3-bedroom homes ranging in size from 462 to 1,481 square feet. 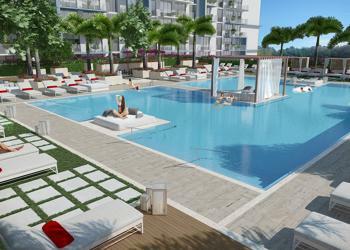 Each has an outdoor terrace, many of which will overlook the lush Downtown Doral Park. The individual condo units of 5350 Park will have floor-to-ceiling sliding glass doors and spacious balconies overlooking the Downtown Doral paseo (Main Street) and park. The kitchens will have designer cabinetry and a contemporary mosaic backsplash. Kitchens and baths will have quartz countertops and the flooring will be 24 x 24 porcelain tile.